Home Home Server How to install Sick Beard on Android to download TV shows? Recently, it became possible to install Sick Beard on Android. 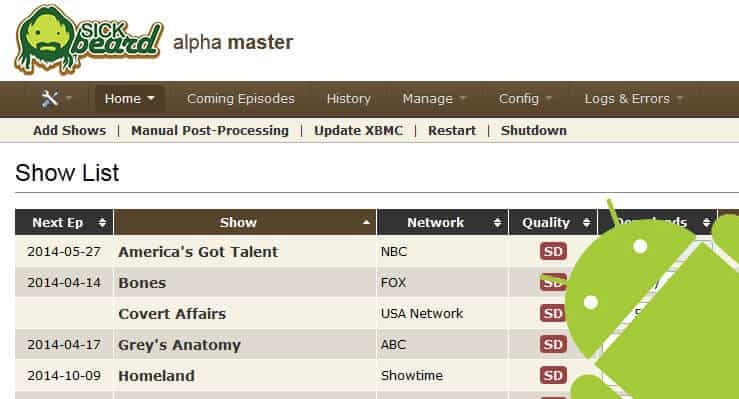 Sick Beard is a wonderful set and forget python script to automatically download and pass TV show torrent files to torrent downloaders or NZB files to NZB downloaders. It has been available for Windows, OSX, and Linux for many years. Our previous guides describe what is SickBeard and how it compares to NzbDrone, how to install SickBeard on Windows and Ubuntu, enabling Piratebay support, and configure SickBeard. We even wrote a script to simplify Sick Beard installation on Ubuntu. 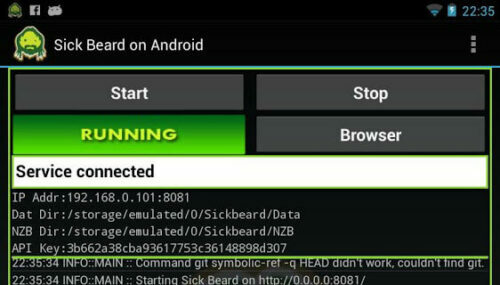 The Sick Beard on Android app has made SickBeard Android installation possible. So let us look at how to install Sick Beard on Android devices. For SickBeard Android installation, all you have to do is to head over to the Google Play store and download SickBeard on Android app. During installation, you will be asked to download Sick Beard Runner app, which needs additional 25 MB of storage. Download and install the Sick Beard Runner app as well. In addition you will also be prompted to download about 3 MB of Python files required for Sick Beard Android to run. Once the SickBeard Android installation completes you are good to go. After you install Sick Beard on Android, starting it is just a matter of scrolling through your apps and opening the SickBeard app. In order to make Sick Beard function properly, you will have to install and configure newsgrabbers. On Windows and Ubuntu, we have shown how to install and configure SABnzbd+ to properly automate downloading TV Shows. SABnzbd+ does on run on Android, but you may use apps such as Nzb Leech or NZBGet Mobile as Usenet downloaders. As mentioned earlier, you also require a reliable Usenet account. You may get a free Usenet account as described in this post, or go with a reliable Usenet service from Astraweb or Newshosting. Sick Beard should automatically download and organize your favorite TV shows in the folders that you want. Now the only thing you need is an awesome media player. While there are tons of players available, nothing comes close to the free VLC, or even better XBMC. So go ahead what are you waiting for, install Sick Beard on Android and convert your Android device to a mini media center.